Halva is a traditional Middle Eastern sweet or after-dinner treat made from ground sesame seeds, nuts and honey. Here it adds a new dimension to creamy vanilla ice cream. Place the cream in a heavy-based saucepan over a low heat. Bring to just below boiling point - do not allow to boil. Beat the yolks with the sugar until pale in colour and creamy. Pour the hot cream very gradually over the yolks, whisking well between each addition. Pour the mixture back into the saucepan and return to the heat. Stir continuously until the mixture becomes thick and custardy. Do not allow to boil. Remove from the heat. Crumble the halva and pistachios into the custard. Stir until the halva is combined and there are no lumps left other than the nuts. Allow to cool completely then spoon into 10 x 125ml dariole moulds or individual pudding basins. Freeze for 4 hours or until solid. Remove the ice cream from the freezer and place in the fridge for 30 minutes before serving. Meanwhile, prepare the barbecue so that only embers remain (or preheat the oven to 200°C, gas mark 6). Halve the figs. Place them on a double layer of foil large enough to hold them. Drizzle with the honey and the rose water, if using. Gather up the foil to make a spacious parcel and seal the edges. Heat for 20 minutes or until the figs are just soft. 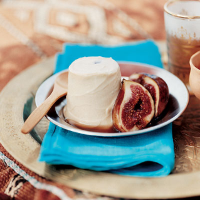 Serve the ice cream with the hot figs and syrupy honey. Prepare the figs ahead and heat when required. Use the leftover egg whites for making meringues, or freeze in 2 batches in airtight containers and keep for up to 1 month. For rose meringues, whisk the whites until firm and add a drop or two of rose water. Use 2 x 250g tubs Mezap Halva with Vanilla instead of the pistachio version, if you prefer.